Aunt Bertha, Inc. is putting 21st-century technology to work connecting people in need with programs that can help them. 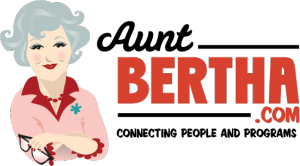 Aunt Bertha provides the digital tools and processes that make gathering information about human services, keeping it accessible to those in need, and collaborating around data management faster and better. Learn more about the Open Eligibility Project, a collaborative for a better human service taxonomy. The taxonomy is a simple way to categorize human services and human situations. With these common categories, we, as service providers, navigators, and people in need, can find human services quickly and easily.